From infancy to youth, I was neck deep in Christianity, as devout as any, lost in love and appreciation for an Almighty Creator I had been taught to fear and respect. Throughout my upbringing, I constantly encountered situations and teachings involving my faith that raised numerous questions for me that never were answered to my satisfaction. Hence, my faith weakened. But I blindly followed, as I was taught to do. The beginning of major distaste for organized religion, though, came about in my teen years. I wanted to hang out with my peers and was not allowed. I could not fathom that any person who did not share my religious beliefs was simply going to perish in a bad way because their faith was different from mine. I was taught that any association with any person outside of my religious organization was a bad association, a danger to my faith’s health, worthy of public reproof. Now I realize “they” were terrified of my trained narrow mind being in danger of opening up and seeing the big picture. It has taken me quite some time to forgive the lost years of useless wandering yet I realize they played a necessary role in my personal evolution. They were responsible for my new found freedom in a terrific cause and effect way. If the control freaks did not exist, there would be less appreciation for freedom of thought and action and I wish to express my gratitude to those that controlled my early years because now I’m on the outside of the box and I’m freer than I’ve ever felt before. I am no longer in fear of thinking for myself. I see the world as it is… brimming with character; colour and vitality. I have discovered that the inherited traits and ways of my people contribute to the world being a whole planet of living, learning and evolving beings. We, as individuals, are responsible for embracing our folk’s culture and ensuring that our own offspring are capable of continuing to carry the torch, so to speak. Although almost the entirety of my immediate family are still deeply entrenched in Christian beliefs, I myself came to know Odin a short two and a half years ago and in that time frame, I have evolved from a lost soul searching for answers into a student of life’s great university. Becoming an Odinist has come so naturally and easily, I can hardly dispute that it’s probably always been in me my whole life and I’ve finally discovered the missing piece of a puzzle that I’ve been striving to complete. I never tire of expanding my knowledge of the myths or learning how to apply a virtue in my life. I crave this because it existed in my folk’s blood, now my blood long before I found my path. It is a part of my heritage as are all of the other things I cherish. They flow through my veins as they flowed through the veins of my ancestors. But the hardest part of becoming an Odinist, for me, has been discarding all of the guilt that goes hand in hand with Christian beliefs. The guilt of using your own power to make up your own mind, to decide your own decisions and to be confident that you are capable of being your own professional when it comes to creating your own identity in your life. The biggest part of this identity revolves solely around your individual heritage, which is your birthright, a privilege granted to you by virtue of your birth. To deny your heritage is to deny who you are as person, as a whole. And yet the world in general has been sadly deprived of a healthy respect and loyalty to their heritage. As a result, common Christian belief, today, suggests that all races should become one race unified under one Almighty God without diversity. The thought of a culturally blank world is quite disconcerting, impossible and morally backwards. Without many different Gods and Goddesses, we lose our many diverse cultures, creating a very bland world. So it is your responsibility to take pride in your race. Give due honour and respect to the gifts you’ve been given through your ancestors’ chosen path. Embrace your heritage, embrace your birthright. My gut burns to set the world straight and right the imbalance that theft of heritage has created for my curls are reddish blonde. My eyes are green like shaded, mossy rocks. My skin is as creamy white as my mother’s and grandmother’s. I grew up in the wheat fields yet the mountains and rivers call to me on a daily basis. My fingers long for the feel of dirt. I must grow something. I am compelled to read and write as much as I can. I love to paint, draw and make music. I have to dance and more than anything I must create. I can’t soak up even enough knowledge for I crave it with every cell of my being. It satisfies me and enables me to increase my self-reliance. No matter the situation, hard, strong work whether physical or mental is the solution I believe in. I want to scream from the tops of the highest mountains, “I’ve made it. I’m free! I’m on the right path and I’m allowed to be me!” If there was one piece of advice I could share at this time in my life’s journey, it would be to never close your mind to the endless possibilities that life presents. Rather, open your mind to the countless opinions, suggestions and supposed “facts” that fill our busy world and set your filter on high. Remember, you’re the boss and only you are in charge of your path. You can be sure your ancestors would be proud to see their collective spirit continue. If your heart longs for it and the thought of it makes your blood hum, don’t deny yourself. Honour our ancestors and our holy gods and goddesses by embracing our heritage. Let us set an example for the world of generics. 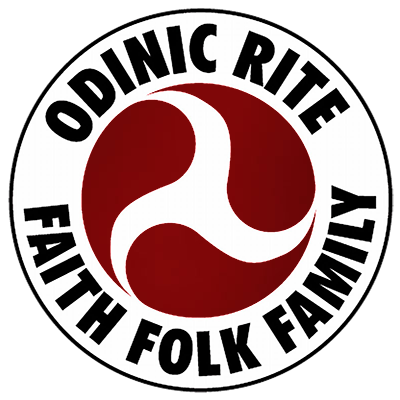 Odin and our holy faith is an integrally large part of my heritage and my blood. It calls to me and makes my entire heart swell with tearful pride and thankfulness. I feel reborn and renewed with a zest for life and energy. My spirit carries a sparkle I’ve never felt before and I feel calm, so calm. I can, I am and I will because I can feel the full support of my folk holding me higher and stronger than ever, leading the way. And now, my blood sings constantly, for no matter what, I know I’m on the right path, the path of freedom, the path of my ancestors, the path of my heritage, my birthright. Hail the High Ones, our Holy Gods and Goddesses! Hail Faith, Folk and Family! Hail! Hail! Hail!